Quote - Brigadier General Charles Elwood Yeager. — Brigadier General Charles Elwood Yeager. You’ve hit resistance, just like Chuck Yeager sitting in the X-1, and unless you know what you’re doing your cryptocurrency journey is going to be an uncomfortable ride. Imagine sitting in the nose cone of a flying bullet. You’re on the edge of out of control. You’ve got no ejector seat and no way out. If you fail, you die. Your dials are cracked, and you’re being thrown all over the sky. At this moment you can back off, or you can punch the afterburners. So, how do you know when to push it, how do you know when to punch through? Success in trading the cryptocurrency markets seems to based on rules and wisdom. But have you ever thought about who made these sayings market lore? Things like always use stops, don’t catch a falling knife and don’t buy a “dead cat” bounce — actually that one is true. The number one thing you’re taught as a new trader is to use stops. But this is a half-truth. The stop you are instructed to use is a “hard” stop. A price somewhere in the order book that marks the place, with a large red ink pen, where you are going to get out. Think about it. The 95% are all placing stops, in bright red ink, en masse. And they don’t think anyone can “see” the stops? Right? Sorry. Wrong. The 5% club know where they are. Because the 95% place stops according to the rules they’ve been so helpfully taught. It’s difficult for new traders and investors to trade successfully. Don’t worry. It’s not you. It’s a combination of your natural biases, biases that work in your favour in other areas of your life, and your education. But not in speculation. Not in trading and investing. If you want to join the 5% club, you’re going to have to act against your conditioned behaviour patterns. And it’s not easy to do. If you’re going to strap yourself into a flying bullet that has the potential to destroy your savings (and more), you’re going to have to trust the knowledge you’re using when you put your capital at risk. If you’re following a cryptocurrency guru on YouTube, and you follow buy and sell recommendations, then you’re following a tipster. Ask yourself — What is their motivation to teach you? Could the helpful guru be teaching you to provide liquidity to the other side of the trade? What will you do, if you follow a tip to get in and buy, and shock, horror, the market goes down. When, and at what price will you get out? Trading and investing with confidence requires you to trust the information and feedback you’re receiving, but most important of all, success in speculation requires you trust yourself. Trust comes from being able to ask the right questions, trust comes from figuring out a plan and acting on it, and trust comes from understanding yourself and how you react to wins and losses. Trading and investing in cryptocurrency markets has the potential to change your life. It has the potential to give you what you desire the most. One word. Freedom. But what can give you freedom, also has the power to destroy you. The journey towards self-sufficiency and freedom begins with trust. Trust in the information and trading strategy you have figured out, and not in a tip received on YouTube. Beware the Kingmakers. Learn to ask the right questions. On the 6th of February, 2018, Bitcoin made a low. 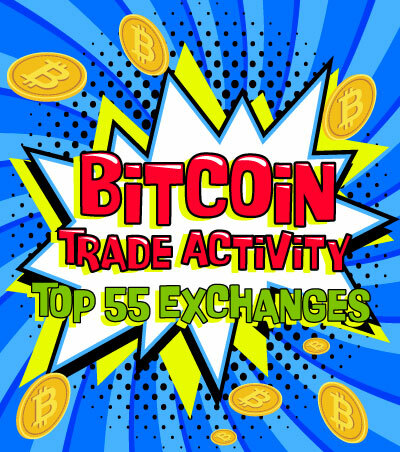 Because Bitcoin represents around half of the entire cryptocurrency market, and because most alt-coins are positively correlated to Bitcoin, we can use it as a proxy for the whole cryptocurrency universe. How do you ask questions of a market? In the chart above, you’ll notice a grey box. The buying tail of the Plus-One day (see Thinking In Threes) is used to create this testing zone. If a Plus-One day holds, the highest probability is to trade higher up to a price where sellers are willing to re-enter the market and sell. Sometimes a Plus-One day will be the low of the move, this is called a “V” shaped low, but it’s the lowest probability. The most likely behaviour, after a vicious move down, is for the market to bounce and then come back down and “Test” the price zone created by the buying tail. It’s during this process the 5% club start building a position for a trend move. If you said the 5% club, that’s the right answer. The 95% generally don’t act with enough focus to stop and reverse a high momentum decline. But the 5% club do. If you doubt this, perhaps you should think about who’s doing the selling after the market has moved down a lot. Again, the answer is the 95%. The 5% club don’t generally sell down at these levels. Because doing so has the lowest probability of success. The 95%, the weak hands, panic and get out. They have no plan, and they don’t understand how markets move. You might be thinking if it’s possible for the 5% club to “engineer” a move down to rattle the 95% into selling, allowing them to pick up cryptocurrency coins and tokens on the cheap. Not only does it happen, but it also happens in all liquid markets, stocks, forex, bonds, and most definitely in cryptocurrency markets. It’s how markets work. You might be thinking it’s illegal. It’s not. You might be thinking it’s not fair. It’s not. But this is how all markets work. Plus-One days are so useful because they give you direct market feedback on the current state of supply and demand. If a Plus-One day, like the one above fails, it’s direct market feedback that supply is overwhelming demand. And to expect lower prices. Bitcoin reacted away from the Plus-One day (6th of February) low. If you’re a short-term trader, you had the opportunity for a successful position of between one to five, five to thirteen or maybe even twenty-one to thirty days. Why this number of days? It's because they are the most common durations for counter-trend rallies in a bear market. But what if you’re a long-term speculator? Buying the first reaction move off of a low, after an aggressive move down has a low probability of long-term success. By late March Bitcoin’s rally had failed and prices were testing the buying tail from the 6th February low. This first test has the potential to be a long-term low. The right question to ask is this: If this low is going to be a long-term low, how much time would you think you’d have to get set with a position? An hour? A day? A couple of days? In this case, it took fourteen days to move up and out of February’s Plus-One day tail. Keep it simple. Ask yourself, if this is such an excellent deal, why is Bitcoin on offer for fourteen days? Bring it back to your understanding of how markets move. Prices go up when demand outstrips supply. It took fourteen days for demand to absorb all the supply in the February low buying tail. It’s feedback from the market, and it’s telling you the odds of this low being the long-term Bitcoin low are not in your favour. What can you do with this information? You could step aside and not trade, or if you are a short-term trader, you could position for a short counter-trend rally. By the time of the first test in late March, it’d been over one hundred days since the Bitcoin all-time high. Had the bubble collapsed? Was this the end of Bitcoin? And, because Bitcoin still represented a large percentage of the overall cryptocurrency market, the end of cryptocurrencies? Instead of relying on Twitter, YouTube, Google, and Facebook learn to ask the right questions. Here’s a chart of the top cryptocurrencies, including Bitcoin, made into an index. You can see at the time of the late March test that the index had already made new lows. The market is telling you the demand for cryptocurrencies is not there. Bitcoin is no longer hot. A good question to ask is: In March of 2018 if Bitcoin is no longer the hottest market in town, what has replaced it? The answer is Amazon. So far, in 2018, Amazon accounts for 36% of the SP500’s total yearly gains. In fact, 84% of the SP500’s total up move this year is accounted for by just four stocks. Four. Amazon with 36%, Microsoft with 18%, and Apple and Netflix with 15% each. By the time of the late March test, Bitcoin had lost its shininess. The masses and the media had moved on to something else. They’d moved on to the stock market. Is there a way to see when Bitcoin lost its position as the hottest game in town? The red line is Bitcoin priced not in US dollars, but in Amazon shares. The blue line is the Amazon share price. By mid-January 2018 Bitcoin was no longer king. At its peak, Bitcoin was worth seventeen shares of Amazon. Today, Bitcoin is worth just over three. Still weak. It’s a first test of the February low but it’s taken fourteen days to move out of the testing zone, the February Plus-One day buying tail. There was no focused buying by the 5% club. Bitcoin is no longer the hottest game in town. By figuring out the likelihood yourself, you’ve made a giant leap towards being self-sufficient. Being a non-believer is easy. Listen out for conversations in coffee shops, or anywhere we gather to chat with friends or colleagues. Most people require certainty in their lives, and they want a binary answer. Will it work? Yes or no. Speculation does not work like this. If successful speculators were engineers, planes would fall out of the sky? Why? Because engineers work with exactness. They work with precision, and because they work with exact measurements, they often make terrible speculators. They bring their life experience, training, and intelligence to a new field that doesn’t play nice with their engineering skills. They attempt to shoehorn their old skills into a new field. If you take the time to look around, you’ll find plenty of examples of charts only an engineer could have developed. I’m not picking on engineers. I mention them because, after being successful in their field of expertise, a lot of them are attracted to speculation. Programming indictors and coding trading bots are heaven if you’re an engineer. What is Bitcoin’s relative strength against an index of the top coins? Can you see evidence of focused buying? What does Bitcoin look like if priced in the hottest new market in town, in this case, Amazon shares? Trading and investing is a business where simple works. The general rule is this. If you can’t explain it to a ten-year-old, it’s too complicated. In a letter to British scientist Joseph Priestley in 1772, Benjamin Franklin explained how he made decisions based on imperfect information. Franklin called the process his moral algebra. Let’s bring this technique into the 21st century and use Wade Wilson’s (aka Deadpool) method for pro-conning a situation. By asking these simple three questions, (see Thinking In Threes) you are evaluating the likelihood of Bitcoin making a low in late March 2018. Question 1: Does Bitcoin have a relative strength greater than the index of coins. Question 2: Is there any evidence of focused buying? Question 3: Is Bitcoin still hot? Imagine the three questions are coin tosses. There is a binary answer to each question, Yes or No. And there’s a 50% chance of a Yes and a 50% chance of a No. You can use simple poker math and put a number on your answers. What is the probability of all your answers being no? Your original question was, in March 2018, has Bitcoin made a low? After asking the questions, you’ve figured out that Bitcoin has a 12.5% chance of this low being a long-term low. Ask yourself would you bet on an event where you have a one in eight chance of being correct? In Shapeshifter we talked about Expectancy. It’s a tool the 5% club use to evaluate if their idea is likely to be profitable. If we plug in the 12.5% chance of winning and an 87.5% chance of losing into the formula, You’d need at least a win-to-loss ratio of seven times your risk for this trade to break even. If you expect the market to rally, but think the low isn't a long-term low, you, by inference, expect the rally to go up no longer than three to five, five to thirteen, or twenty-one to thirty days. It’s much less likely for the price to move far enough for you to get a payout of at least seven times your risk. Instead of guessing, you’ve calculated the risk, and unless you’re a longer-term trader, it’s not worth taking the trade. The option you do have is to go down a time frame and expect to be in the trade for a much shorter period. In going down a time frame, from daily to hourly, you can reduce your risk. And in lowering your risk, you give the expected rally in price a higher probability of meeting your accepted payout rate. The 5% club don’t think about how much they’re going to make. They think about how much they are about to risk. If you are going to buy the first test of the Plus-One day low in late March, where are you going to get out? In late March, Bitcoin moved an average of 708 dollars a day. If you are looking to enter into a long-term position you’ve got to give Bitcoin room to breathe, so you need to give Bitcoin at least 708 dollars of room. 1.5 to 2 times the average daily movement is common as an initial risk. If you used 1.5 times the daily movement, you’d have to let Bitcoin move +/- one thousand dollars. If you’re risking one thousand dollars, then seven times your risk is seven thousand. Here’s the expectancy of this trade. Risking one thousand to make seven thousand to get to breakeven expectancy is not a great bet— if you expect to only be right one time in eight. Using simple math, and a 250-year-old idea brought to life by Deadpool, you can put a number on your analysis. And when you can do this, you’re on your way to becoming self-sufficient. Beholden to none. You’ve transmuted something abstract into something real. With something real, you can measure your performance. If you can do that, you’ll have something concrete. You’ve engineered a way to trust your ideas. Bitcoin rallied three thousand five hundred and twenty-one dollars. The rally failed and over the next fifty-five days traded back down to new lows for 2018. The rally was a trading opportunity, but it wasn’t a great long-term trading opportunity. The 5% club knew why, and now you do too. 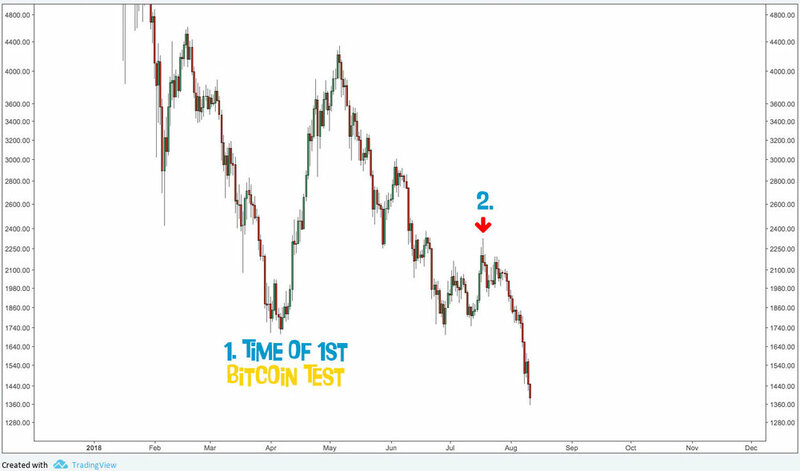 On the 29th June, Bitcoin made a new low as part of a second test of the Plus-One day from February 6th. What are the odds of 29th of June low being a long-term low? Using the same questions we asked earlier we get the same answer, and you assign the probability of the June low being the long-term low at 12.5%. If you take a position, where are you going to get out if you’re wrong? The average range Bitcoin moves a day has halved since the March low. Now you can risk five hundred dollars. But to break-even, you’ll still need a seven to one risk ratio. Bitcoin will need to move around three thousand five hundred dollars if you expect to be right only one time in eight. Has anything else changed? Is there any more evidence that’ll bump up your win rate? The June low is the second test of the 6th of February low. One thing that’s positive is aggressive selling is absent at the lows. A good question to ask yourself at these times is who’s trapped? Who has to get out? In the Revolver article, podcast, and video, we covered how the crowd reacts to danger. Re-read the story of the crowd at the concert now. If you look at the chart of Bitcoin priced in Amazon shares, it’s clear no one is trapped. Bitcoin is no longer the hottest game in town. The baton has been passed on to Amazon. The likelihood that the June 2018 low is a long-term low is, as your quick back of the envelope calculations show, 12.5%. What has to happen for Bitcoin to reach escape velocity and break out of this down move and basing pattern? Go back to basics and think about how markets move up and down. It’s the ratio of buyers to sellers in the order book. If the weak hands, the 95%, have been shaken out of their positions who are left to panic? Think about who produces Bitcoin and how they make a profit. The highest probability is for Bitcoin to rally until it hits a price where supply is ready to absorb the demand. If at the price where you expect supply to overwhelm demand, the opposite happens, this is direct market feedback. It’s bullish and an indication of higher prices to come. Between the 5th of May high and the June 29th low, there are four high probability areas where the signature of supply overwhelming demand is visible. Bitcoin hit three out of four of them during its twenty-five-day rally. Demand absorbed the supply at the first two areas, but supply completely overwhelmed any new buying at the third. And as Bitcoin rallied two thousand seven hundred and twenty-two dollars off the low was there any further market feedback that the rally would not last? Bitcoin and the top-alt coins are positively correlated, when Bitcoin goes up, they go up, and when Bitcoin goes down, they go down. Until there is a de-coupling between Bitcoin and the other coins, you can use this as evidence for the strength of any rally. Is the cryptocurrency market strong as Bitcoin rallies? The relative strength chart of Bitcoin and Ethereum during the rally tells you a lot. Ethereum failed when it reached the first area of supply. These coins including Bitcoin represent 91% of the entire cryptocurrency universe. (By market capitalisation) If only one coin didn’t fail at earlier levels of supply, what does this tell you about the strength of the market? Only one top coin didn’t fail. It’s telling you that breaking through the rough air and buffering of this base and moving into the clear and smooth air of a new trend is not likely to happen. It’s telling you the likelihood of success is low. And it’s telling you something else too. 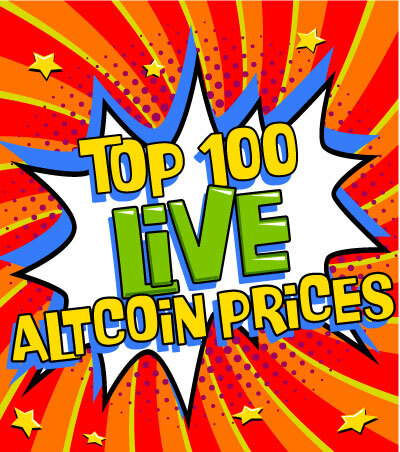 It’s direct market feedback that the single coin whose relative strength held up better than all the others, is the strongest coin. Put it on your watch list. The name of the strongest coin? If you want to be a member of the 5% club, do the work. 95% won't.